This week’s news has been dominated by the British General Election and the (widely predicted) hung parliament. As party leaders begin to negotiate with each other and their members, there is still great uncertainty about the next Prime Minister and the composition of the next government. Whilst there are many talking points, the issue emerging as a key factor in any prospective coalitions is electoral reform. In The Guardian yesterday, Polly Toynbee stressed the importance of electoral reform and the prospective coalitions on the table. The protests in London yesterday lobbying the Liberal Democrat leader Nick Clegg on the issue of electoral reform also demonstrates public concerns over how elections take place and issues of representation. In the midst of uncertainty and change, a more everyday geography of protest and debate is taking place, for example this sign photographed in Hackney, East London. In an article for Geography Compass, Ron Johnston and Charles Pattie describe elections as a “geographer’s delight”. Through examining British general elections over the last sixty years, they highlight the “inherent geographical activity” of elections. 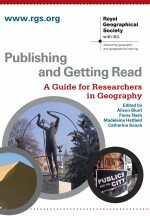 Indeed, electoral geography has been a cornerstone of political geography and remains an engaging area of current research, particularly with developments in GIS and mapping. As the story of this election continues to unfold, geographers should be well placed to contribute to discussions on the emerging events, and particularly on the geographies of electoral reform. Read Polly Toynbee in The Guardian on the issue of electoral reform. This entry was posted in Geography Compass and tagged British General Election, coalition, Conservative Party, David Cameron, Economic Geography, Electoral Reform, Gordon Brown, hung parliament, Labour Party, Liberal Democrats, Nick Clegg, Political Geography, protest, Social Geography, voting on May 9, 2010 by sarahmillsaber.